I have always been profoundly interested in spirituality and in the philosophical aspect of things all of my life. I do not belong to any organized religion because, like separative countries, organized religions tend to divide people and (to a large extent) tend to be a form of tribalism which leads to conflict and war. Though i am not one to put any credence or reliance into “belief” — since belief tends to be the crude result of a blind acceptance of presuppositions, conclusions, or group acceptances — i am very interested in investigating into truth and holistic order. I probably had read the New Testament, by the way, many more times than my brazen cousin did. Years ago, when i was quite younger, i hung around a lot with Professor David Bohm, talking one-on-one with him often about the deeper aspects of truth and reality. David Bohm was a co-worker with Albert Einstein, by the way. Einstein loved Bohm and called Bohm his “spiritual son.” I’ll never forget the wonderful discussions that we had. As far as the Bible goes, most biblical scholars agree that most of what was handed down over the years has been grossly distorted over time from what the historical Christ actually said (i.e., distorted by mistranslations and intentional, self-serving additions by others). However, probably if one is truly wise, one can — to a large extent — tell the difference between the weeds and the wheat. and listen with their ears…'”. So, here, in this alleged saying, Christ seems to be saying that he will be telling special things (or even secrets) to those that are close to him, who really care. He also seems to be saying that the masses get parables but not the direct, significant, straight teachings. As in ancient times, most people do not inquire into what such special teachings may have consisted of; most did not inquire into what such special messages were about. The ancient Gospel of Thomas was discovered in an earthenware jar in 1945 in a desert by a poor farmer who was digging for fertilizer. Additionally, Greek fragments of the gospel were found in ancient dump heaps. The Greek fragments were an even earlier example than the 1945-discovered Coptic version, and were likely a more pristine version of the gospel (and likely are less distorted). I hope someday that a full, early Greek version of Thomas is discovered! Many prominent biblical scholars maintain that the Gospel of Thomas was written before any of the four (previously oral) gospels were written. There is much evidence — and books have even been written on this — that the Gospel of John was written as a rebuttal to the Gospel of Thomas. Ancient people who were appreciative of the Gospel of Thomas were all butchered and killed by the ancient Bishops and their followers, long after Thomas was written. The Gospel of Thomas is not full of weird miracles and tons of parables but, instead, contains more direct, simple wisdom sayings and suggestions to look within (rather than to intermediary priests in temples). Do you think that an early gospel — though it was dearly accepted by many early in the history of all of this — would be tolerated by the self-appointed religious, orthodox “authorities” while it suggested that one look within, while it condemned the temple leaders? The Pharisees, the strict, orthodox, temple-attending people at the time of Christ, were often referred to in a negative way in Thomas (and in some of the other new testament gospels). Jesus was, at first, a follower of John the Baptist, who despised the “high-ranking” Pharisees and Sadducees, the religious leaders (of organized religion) in Israel at the time of Jesus; John got as far away from the temples as he could… (into wonderful, beautiful nature) to speak to the people, away from the orthodox priests/rabbis. It was likely these religious leaders who had John the Baptist terminated, and it definitely was the leaders of organized religion who had Jesus killed (as well as, later on, all of the admirers of The Gospel of Thomas). Do you know what they did with popular iconoclasts in the distant past? They nailed some of them to dead trees; and, very possibly, if they became exceptionally popular, they twisted around and distorted what they had said to suit their own power-hungry ends. These are the hidden sayings that the living Yeshua spoke and Yehuda Toma the twin recorded. Two will rest on a couch. One will die, one will live. and eaten from my table as if you are from someone. I am the one who comes from what is whole. I was given from the things of my father. but if divided, you will be filled with darkness. Show me the stone that the builders rejected. A good book to read, if you are really interested in this, is “The Five Gospels: What Did Jesus Really Say? The Search for the Authentic Words of Jesus” by Robert W. Funk. However, I feel that what is most important is to not rely on past writings or sayings of others — especially rather antiquated ones — but, instead, to perceive freshly and find out for oneself (without dependence on organizations and handed-down beliefs). 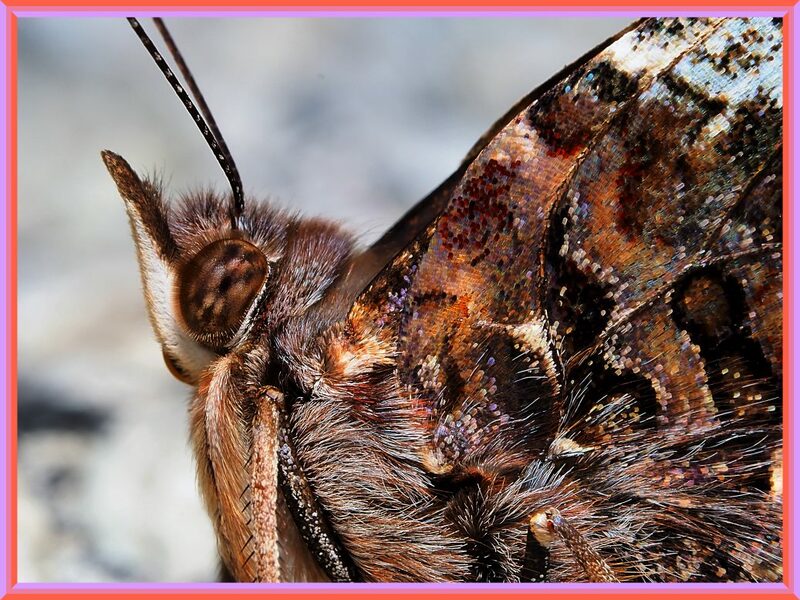 This is a male Snout Butterfly. The males have four legs and a pair of unusable anterior legs; those unusable, anterior legs can be seen in the photograph. The females have six usable legs. Thank you, Mitza! Yes, i read sections of the B.Ghita. Like the Bible, however, distortions and mistranslations (of such writings) set in deeply over time. The intelligent thing to do, then, is to inquire and to discover for oneself (i.e., to ask the right questions to oneself and to probe deeply). However, most people are unwilling to do that. They want to depend on some organization or on some doctrine (i.e., some organized belief). Manmade organizations and the direct truth usually have very little in common. Look at the state of the world now (with all of the manmade organizations having contributed much). Great that you found it interesting, M! 🙂 A good book to read, if you are really interested in this, is “The Five Gospels: What Did Jesus Really Say? The Search for the Authentic Words of Jesus” by Robert W. Funk. However, I feel that what is most important is to not rely on past writings or sayings of others but, instead, to perceive freshly and find out for oneself (without dependence on organizations and handed-down beliefs). Interesting post and I don’t think that your older cousin should have told you “It’s too bad that you are a heathen.” And especially in church – that’s not the forum. Interesting name for the butterfly as well and why does the male have two legs that go unused? Well, i don’t speak with her anymore at all. I’ve surpassed my lifetime quota regarding interactions with very barbaric, crass so-called humans. Too many people, Linda, are indoctrinated by a small and fragmented sense of family. The whole world and all of its creatures (both large and small, dumb and intelligent) are my family. I found your blog looking for additional info about the Gospel of Thomas. Thanks for posting your thoughts. I too, Tom, have had the “experience” after decades of intense searching for truth. My research has led me to believe there never was an historical Jesus. Everything wise in the Bible was already said long before. I can’t believe they have you put your hand on the Bible to prompt you to tell the truth, when there is no book with more lies and contradictions than the Bible. I don’t read this stuff much anymore… and never did much anyway; the important thing is to find truth for oneself. Those who issue judgments always fascinate me, though that is the trap for all of us if we’re not careful. The gospel of Thomas is my favourite. One of the other thoughts is that there is another preceding even that, and, that Thomas may be the elusive Q – the one that was the basis for the synoptics (Mark, Matthew, and luke), and yes, who would let that come out. Yes, i’ve long suspected that the G. of Thomas is Q. It probably really is. Then the organized so-called religious leaders (who were criticized by it in the first place) came around and connivingly twisted it all up to suit their lust for power and dominance over the people. People are so easily deceived; that’s why so many crooked politicians can bamboozle millions! I always find it so very interesting that often the most “devout” (believing in whatever dogma) individuals often prove to be the most ignorant and lacking in empathy. Yes, and the same thing was going on over two thousand years ago! I take the mail to our neighbor, a widow, because she can’t walk well. I saw she was piling all kinds of boxes of cereal and things right on her stove; she also often cooks on it. She is around 90 years old. She is taken to church by her family every week. When i politely asked her not to store stuff on top of her stove because of the danger… and she has a giant propane tank right between our two houses to heat her house… she, a day later, put even more stuff on top of her stove. No empathy whatsoever! Hypocrisy was going on with organized religion over two thousand years ago and it’s still going on; nothing has changed. Just look at what the world news is reporting now! Fascinating, Tom! I guess all religions begin simple and spiritual and then get embroidered and eventually rigid and divisive. It’s certainly true of Hinduism. I find Nature a wiser teacher than anything written … Nature is not static and neither is truth, which means the interpretations of the moment by any one individual are likely candidates to be untrue for others as time shifts all in some swirl pattern none of us can anticipate. Yes, but i think it goes much further than what Nature can teach. Nature is often brutal and competitive (though there is an overall holistic balance there and many really beautiful things). Yes… truth is not static. 🙂 A mind wanting a concrete blueprint to truth is plum out of luck! A bit of dichotomy here, Thomas. At first you are saying you don’t participate in organized religions, you don’t put credence in “belief”, described as blind acceptance, and you are interested in investigating the truth. Then the rest of the post is built on a single faith’s holy book, which may be start to finish a fiction, you refer to it as gospel, and speculate as to how much it may have been edited, revised or rebuffed. The message remains unclear to me. I just call it a gospel because that is what everyone else is calling it, even people who think it is a bunch of hogwash. I do see some things in it that are indicative of a deeply intuitive mind that has seen something profound, which is pretty remarkable (if true), due to the many years of translation. 🙂 One thing is clear. Someone initially wrote it. I don’t care if that someone was the historical Christ or not; whoever wrote it was probably very wise (which is a rarity these days). I gleaned some sweet stuff from it and left it at that (which is all that matters). It may not be your cup of tea. That is just fine. I haven’t read it for quite a long time (except for writing this posting) and i sure do not depend on it.